One area we talked about is the area in front of the breakfast room windows (to the right of the front porch). In my own mind, I refer to this area as “the courtyard,” even though it’s not technically a courtyard. But it is surrounded on three sides, and I feel like it could be a really spectacular space — the jewel of my front yard. …and I love the idea of sitting at the table right there in front of those windows and watching the birds and squirrels busily going about their business, gathering food, bathing in some type of fountain, and just entertaining us in general. …but I want to use the same brackets on the trellis that I used on my little portico over the side door of the studio. And then in the middle of the “courtyard,” I want some sort of fountain that the birds can play and bathe in. I envision some sort of shallow bowl sitting atop some large stacked stones with continually running water. And then all of it would be surrounded by beautiful, colorful plants. I can’t find any pictures that capture my vision, so we’ll just use the area with the big bowl fountain in this picture as a jumping off point. It’s not exactly what I had envisioned, but it conveys the general, very broad idea. Ummmm…MIND. BLOWN. I haven’t been able to stop thinking about that since she said it yesterday morning. At first, I envisioned a very small deck area just in that courtyard area, so that there would be steps down to ground level from the front porch, and then one or two steps up to a totally separate deck area in front of the windows. But the more I thought about it the more I realized that in order for that area to be of any use to Matt, it would literally have to be one continuous porch from the current porch. There couldn’t be any steps down and steps up, or any level changes at all. Just one continuous porch wrapped around to the breakfast room windows. So I did a little mock up to see what that would look like. Ummmm…I pretty much LOVE it. But I didn’t have a picture of that area showing the whole area with the side wall of the studio, so I took a new picture and did a second mock up. I didn’t do such a good job on this one, but at least it shows the third wall surrounding that area. And if I do this, obviously I won’t waste money pouring a concrete foundation for the extension. That’s just the best copy-and-paste editing job I could do on short notice. But whatever skirting I add to the front porch would be extended all the way across so that it all looks cohesive. I mean, this really had my wheels turning. That would give an additional 256-ish square feet of porch area. That area, brought out even with the front of the existing porch, would be about 20.5 feet deep and 12.5 feet wide. It would undoubtedly be an expensive project. So the main question I have to answer is, “Is it worth it?” If it’s an area that we would actually use, then I think it would be worth it. But in the long run, when all is said and done, and we have our new family room where the current sunroom is, and the doors at the back of the family room lead out to a big deck that looks out towards our very private back yard, will we ever even think about spending time on a front porch area in front of the breakfast room? Right now, I honestly don’t know the answer to these questions. And if I do this, it will at least have to wait until after I’ve finished my studio and the pantry. In my mind, I can justify spending that money before we do our big addition on the back since that addition is going to cost so much, and it hasn’t even been started yet. But I can’t justify spending that money before I finish the studio or the pantry — two areas that are well under way and are just sitting there waiting to be finished. And plus, I’m at a good stopping point with my front porch as soon as I get the ceiling finished. Regardless if you will use it or not. It really looks fantastic and ties the whole area together ❤️ Mom is spot on. Maybe she will help fund it haha! If you do it you are going to end up wanting a walkout from your breakfast room. The mockups look great – but I think with your long term plans you probably would not use that space once you have space at the back of the house. I agree it looks great and she’d end up wanting a door off of it, either French doors off the breakfast room (aren’t those new windows?) or a single door off the workshop so she could step out and get a breath of fresh air. But then they’ll want some kind of landscaping “screen” so they’re not on full display of the neighborhood when they’re out on it. I had this idea for off our dining room on a house we just sold but never executed it. In hindsight my back would be up every time a neighbor went by walking a dog or just nosing around like annoying neighbors do. The windows could be used to replace old ones elsewhere…some french doors to that little porch would be so lovely, especially, if the plantings provide a little privacy. Even staying in the breakfast room, with the doors open to the outdoors, would be a wonderful way to start any day. I agree with Carolyn. Although extending the porch draws your eye across the whole front of the house and brings more cohesiveness, I think it would also call for more than just extending the flooring. French doors seem like the obvious choice and I would also think continuing the roof covering would seem like what is supposed to be there. That’s really adding a lot more. Not to mention the French doors might also show up the front door and then begin to look like one of those houses that has two entrances and you can’t tell which is the front door. I vote stay with your original idea. Mom’s idea is nice but trust your vision! You are great! I agree that it looks great but probably impractical once you get your back deck done. Plus, it won’t be covered so it will be hot to sit out in that area (I know Waco gets plenty hot). I say stick with your original plan of landscaping and fountain. Your front yard would look pretty with that. Just my opinion. My 2 cents (since you asked :)–I’d stick with your original plan. I think it will be beautiful from the front, and will be well enjoyed from inside. 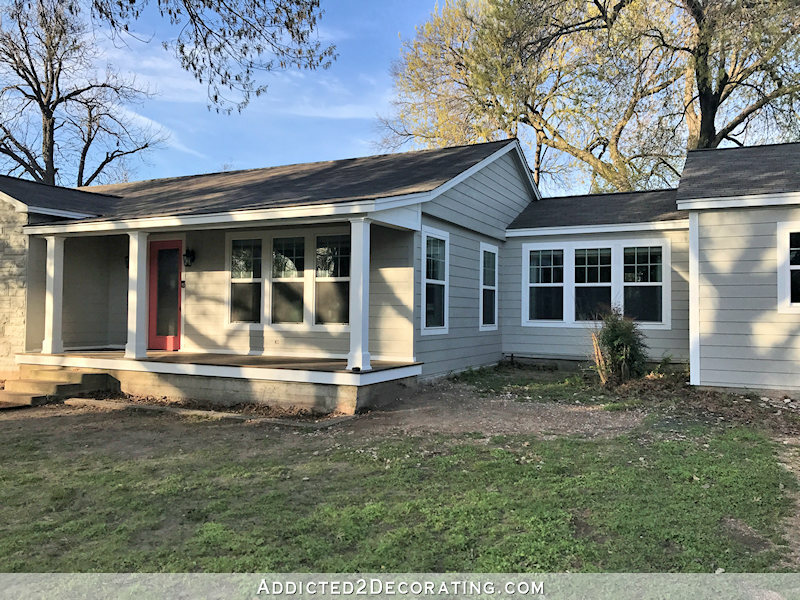 The porch extension does look very nice, and if it was your only option for outside living, the porch would probably win, but I think you will use the outdoor deck off the new family room even more. Also, your back seems pretty shaded, which will make it a more comfortable spot for hanging and/or entertaining outside, whereas this spot seems like it might get a lot of sun and be hot. You could always put some kind of roof or something, but then you’ll be blocking the light going into your breakfast room and even your living room. Sidenote: isn’t it just so much fun to imagine and dream, though? Kristi I so totally agree with Heather B. and the courtyard. You’ll enjoy it so much from the inside regardless of weather. In Texas it can be to hot, to cold, to windy or rainy. Entertaining is best in backyards. The porch will serve you well for sitting out front. I also agree with this train of thought. How many people in your neighborhood do you see sitting out in their front yard or on a front porch? I would guess not many. Though I also really like how it looks, I’d also want walk out doors where your brand new windows are if I were to use that area. And once you finish out flooring, you kind of lose the wildlife aspects. Yes you can hang birdhouses and could even plumb a fountain but would it really be RIGHT sitting on a wooden deck? I’d love to see landscaping/flowers/plants + fountain/butterflies/hummingbirds/squirls vs. a wooden deck extension with chairs, etc. Another consideration is what direction does your house face? If it’s west, oh man an open deck with no overhang west exposure would be HOT HOT HOT. Agree also. The porch extension/deck looks beautiful but would lead to many other changes to be useful. I think the original plan for a ‘courtyard’ with landscaping and fountain would be very attractive in that spot and enjoyed year round from both inside and outside the house. But I know if you decide to tackle it, it will be beautiful. I love following your site to see what you do! I agree with the idea of building a splendid garden space. I 100% agree! 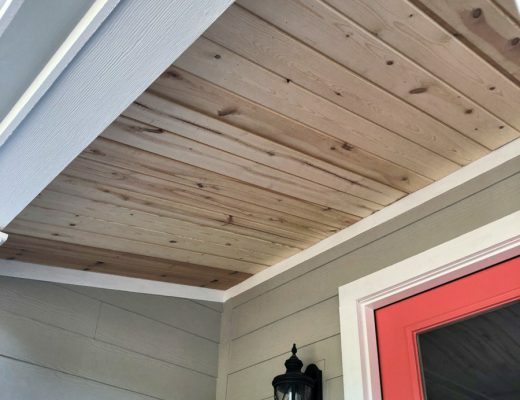 Also, because if you don’t have a roof over this portion of the porch, will it dry out and warp more rapidly than the other under roof portion? I’m thinking Texas heat. I agree with Heather B and continue with your original plan. I think that it would add such beautiful texture and curb appeal to the front of your home. By extending your front porch, I think it looks like an after thought. A beautiful fountain, landscaping, etc. would be a beautiful, relaxing view out your breakfast room windows :-). I agree with Heather B. You and Matt will really enjoy having a wonderful view of birds feeding or splashing in their bath surrounded by plants/blooms while you are comfortable inside. Have this going on at my house and we are constantly surprised at the behavior of birds and squirrels. You have a wonderful private patio planned for your addition. If it were me, I would continue with the original plan as quickly as possible and I am looking forward to following you on the journey. Totally agree with all of the above. Stick with the original plan. Do it for Peeve, she will love watching the birds and squirels :). And, who knows, it may distract her from eating your plants ;). I agree 100% with all of the above… stick with the courtyard! It will be so beautiful and provide entertainment for the whole family, including Peeve! I think in the long run you’d enjoy it more. I agree! Do the courtyard. It will be beautiful and your furry and feathered friends will totally love you for it! I completely agree with Heather B.
I totally agree! I know so many folks who love one area of their home where they can access nature. I love your original idea! I freaking love this idea! Looks great and the added porch space would be wonderful! I think your mothers idea is one of the best, it would enable Mat to get benefit from the front of the house. Having a garden was good but not a feeding station for the wildlife, we have stopped feeding the birds in our back garden, too many unwanted plants springing up and droppings. If you want to stop the unwanted planting you can roast the bird seed. This stops it from germinating, but the birds still seem to love it. According to my research, it might make the food slightly less nutritious, but I figure they get nutrients from other sources too. It looks odd, I don’t like how it looks like a patio deck that should be at the back of the house. Love your first idea with the trellis and fountain. I think the additional porch area really ties the front of your house together. When the time comes, I would definitely go for it. I’m anxious to see how you build up the area without pouring concrete. I was showing my husband yesterday what you had done to see if we could do the same on our concrete porch but I wanted to enlarge our porch. So your post is right on time! Couldn’t you do it as a deck? It wouldn’t be terribly expensive. But I also think a pergola over the new area would be awesome and provide some shade and you could have baskets or train vines up the posts. You would use the expanded porch if there was an inviting feature. I see white Adirondack chairs, the kind made of heavy duty composite and a fire pit feature. Of course you will need to add a bit of lighting. It would be gorgeous, inviting and usable outdoor living space. The view from your breakfast room would then be straight into the back of a collection of chairs …. nothing about the porch extension fits the breakfast room and its use as a pleasant place to look out onto nature. Please consider the effect on your beautiful room. As you said, it comes down to how you would use it. I love a front porch as long as I’m not super close to the street and he views of surrounding houses and yards are nice. We have a big deck (needs work) that we love relaxing on in our backyard where we have a half dozen song bird feeders to enjoy them in the morning and late afternoon. We also have a front porch with a swing but find ourselves in the back more often because on the front porch we get a lot of impromptu visits from passing neighbors. Delightful, but kills some of the day. Also, as a creative, alone time is crucial to production. However, while watching wildlife from inside is nice, it’s also very filtered. You don’t get the sounds and see more than a window matted version of the relationships going on (like watching the different behaviors of dogs in a pack). And having a cup of coffee in the morning with cardinals, house and golden finches, juncos, blue birds, robins and dove couples is an indescribable treat! If it were me, I’d do both. Porch without obstructing the view from the inside but not socking so much into it believing (until tried) it will be the new thing we enjoy. It’s almost hummingbird season, btw. Also good for thought: you could become a monarch waystation by planting tropical and/or perennial (not as pretty) milkweed. Monarchs are in trouble these days and the only plant the eggs are laid on for the larvae to eat is milkweed. I like your first idea better. I think the garden in front would add so much curb appeal. I may be biased though as we have a little bird garden off our dining room windows. My husband is also in a wheelchair and watching his birds gives him so much pleasure. As a previous poster stated, it does require a lot of weeding due to dropped bird seed. We definitely sit out on our back deck more than the front of the house because its more private. It is a good idea, would look nice. But I would really consider if you will actually use it before going ahead. Consider when the sun hits that part of the house. There isn’t any shade in the courtyard part so you really have to think of that. And like you said, if you have a deck and sunroom in the back would you use the front deck? A garden area with bird feeders and a bath and flowers would look lovely too. Would give a nice cozy feeling to the front. And you can enjoy it from inside through the windows. At least you have time to think over all your options. So, I have a few thoughts… Sorry! 1) Why not continue it in front of the studio? 2) It partially depends on if you live in a front-yard neighborhood or a backyard neighborhood. Do you neighbors hang out in their front yards? Do you want to hand out with them? Do you want them to come hang out with you? If you want them over for long periods of time, then go for it. If you only want them over for a short visit, stick with the small porch. 3) If you do the extension, it will get the most use if you replace the breakfast room windows with french doors. To me, having to navigate across the existing front porch over to the new deck area will ultimately become a pain (even though it doesn’t seem like much of a pain now). OR you could put a door going out from your studio to the deck (on the side). I’m a big believer that if an outside space doesn’t have EASY access, it doesn’t get used as much as planned. 4) If you do this deck AND put a deck on the back of the house, will you continue to use this one after that one is in place? I really think it depends on how you spend your time outside. I am in total agreement with the above from Theresa, your mock up looks fab but only because you have nothing in the courtyard area right now. I think you might find it a bind to get to unless you had French doors onto it or another side door PLUS your courtyard idea sounds lovely – save the large decking and social space for the back of the house….. just my opinion of course. I agree. On all points! My first thought was, if you did it you would need a door from your studio to easily access. Don’t know if you would want to give up the wall space. You could still have a fountain feature on the deck, but when you invite the birds there will be seed scattered and droppings. You might want your new planters [studio] to carry the theme of your lower porch look, too. Great points and everything I’d have said, too. I, personally, would go with the courtyard and doing a back porch. We’re not really a front porch sitting family. I really like the extended front porch. I grew up in a village where everyone sat on the front porch and neighbors walking would stop for a chat. I absolutely love the idea! but then the other side of me says that is more wood to keep stained, sealed, painted etc.. I think it would look fantastic but more upkeep in the long run. Either way I know it will look lovely. And I so wish I had commented when you were doing the posts. I’ve been down that road with painted wood outside and having to replace it with PVC! I like the original idea better. The new porch is large, so it will require furniture. Like what?? Will the furniture just be out in the elements? If you put a cover over the new porch to protect the furniture, the natural light inside the house will be greatly reduced. I vote for the beautiful landscaping with fountain and bird feeder. I think your Mom’s idea is good and your mock up looks really good. But, if you are adding a deck to the outside of your new family room, I really don’t think you would use the additional deck space out the front, but I’ll add a another idea/option……….unless of course you had French doors opening onto it from your breakfast room, to go out and enjoy your morning coffee etc. on a nice patio table & chairs. IMHO I think that would look so awesome!!! Yes! That’s what I was going to say.. stick with original plan, unless, of course, you were going to change your windows in your breakfast room into French doors… then it would be much more useable! Except that Matt couldn’t really easily access the extension through these French doors, navigating around the table would be difficult, I imagine. Well, here comes my turn. The new idea (thank you Mom) is very pretty. If this was the back of your house, I would consider it…but it is just too much for that space and seems out of place on the front of the house. Your original plan is much more appealing to me and provides for seasonal versatility. I think that trellis is a better idea at this look. It would’t be really wrap around, just an extension of the porch and it might of looked good if you had french door instead of windows.. seems to be a waisted space. Trees and flowers is a better look. I agree with the poster who mentioned if you decide to put the decking there, french doors make so much more sense in your breakfast nook. Who will walk all the way around to the uncovered area to sit? That would be my question…will it get used? On the other hand, having a pretty garden there, with a water feature would be beautiful. I would recommend bringing that garden out far enough to connect to the landscape beds you would have in front of the current porch and also to beds you would have in front of the far right part of the house. Have the landscaping flow…and use some more formal feeling shrubs along with the flowers. I’m from Michigan – so I would have no idea what kind of plants you could use…but if you lived in Michigan, I would recommend evergreen shrubs that grow together in some mass planting…along with flowering shrubs, and annuals. I vote for the “courtyard” garden! Hi, fellow Michigander! I’m in Ann Arbor! Black oil sunflower seed only attracts songbirds. You can buy it without hulls so there is no mess. We don’t feed a Milo mix at all. I can see a double hook with feeders on each arm right in front of the middle window surrounded by a nice country garden. A few flowering shrub anchors and a birdbath in the center of the mini courtyard would give you continual birding. Do not get a birdbath that is real deep. The birds just need a few inches to bath. Solar floating fountains work well at attracting birds with the sound of water. Save your spot for birds and butterflies and morning coffee enjoyment. You have a nice sunny location that flowers will like. That little area just screams “courtyard”!!!! It’s perfect. Trying to make it into an extension of the porch looks like you’re trying too hard to tie it all together. My vote is to stick with the original plan … it can be a beautiful spot to enjoy from the inside. Personally, I LOVE sitting out in my front yard much more than my back yard! I see fences in my back yard but out front I can see a pond (and get a breeze from it) and say hello to my neighbors and just enjoy what’s happening! I realize your back yard will be much more inviting than mine but I love the idea that you would have the option to sit out front or out back. Front patio areas are beautiful and make a home look very inviting and that area looks like it was made just for that purpose. I’m thinking some kind of trellis over that area that would tie in with your roofline yet not block the light into your breakfast area would be amazing. It would also allow you to add some beautiful hanging pots from the trellis, some amazing seating and a possible fire pit. Just a beautiful, inviting, enjoyable area for you and Matt and friends. Dreaming about the possibilities is always fun and gets the creative juices flowing! I think that’s something that sounds great in theory but wouldn’t be used. We have a fountain outside our dining room and really enjoy watching the birds. Your mom’s idea is brilliant! 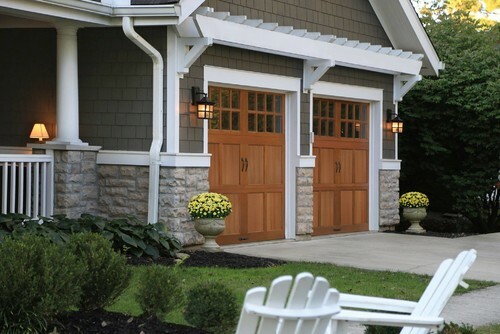 To me, it ties the whole front of the house together for great curb appeal. It naturally leads your eye across the front of the house to the studio. Prevailing winds and sun direction are key. It sounds like bird feeders and gardens don’t mix (unless you’re a constant gardener). In trying to envisage the bird BATH area it felt odd until I imagined it being landscaped separately from the front yard, with higher plants between the two areas, making a “secret” garden. That would be functional now and not preclude the possibility of french doors to a terrace there later. The new mock-up looked odd to me because the current porch projects farther than the studio; I’d want to cut the corner off and put broad steps there. I like the idea of a bird fountain and beautifully landscaped area which will greet people that visit, and you can enjoy EVERY SINGLE DAY from your dining room window! You will LOVE it! You already have a porch that will provide seating to enjoy sitting on the front porch when in the mood. The back yard is where you will most likely linger and entertain. Put your money there! I can see that fountain that will be an eye catcher to everyone that drives by as well! I love the look but agree with those who suggest focusing on a back yard deck instead. Have you and Matt sat out on your front porch so far since you moved in? The courtyard landscaped the way you envision will make the breakfast room and studio look more a part of the house rather than an add-on. Plus the inside view will be beautiful with a bit more privacy as well. I love the idea of a bird station (I envision something like this, maybe incorporating some of your leftover stone, but with a running bath instead of the bowl: https://i.pinimg.com/originals/0d/e5/76/0de57602b9240ab9f545e15c8216afcf.jpg) Texas is bird migration heaven; if you maintain a year-round supply of food and moving water, you will have bird species from all over North America stopping to rest and to feed. I have feeders and a bird bath outside my kitchen window, and I love sitting with my cup of coffee and watching the birds come in and out. The hummingbirds are my favorite! Pro tip: buy the sunflower seed that is already shelled. It’s a little more expensive, but will cut down on the potential of rats. People these days just aren’t front-porch sitters. I think you are far more likely to sit on the back deck (when it’s built) and enjoy outdoor cooking and eating. And, when you do that, you can be intentional about covering some of it and installing porch fans that will help with those hot Texas days and keep away the mosquitoes. I don’t see many people using a front deck, especially one that is uncovered and exposed to the elements. I’m assuming you are thinking an either/or here, but if you had thoughts of still having feeders on the deck, let me recommend against that because it will get very messy and gross. 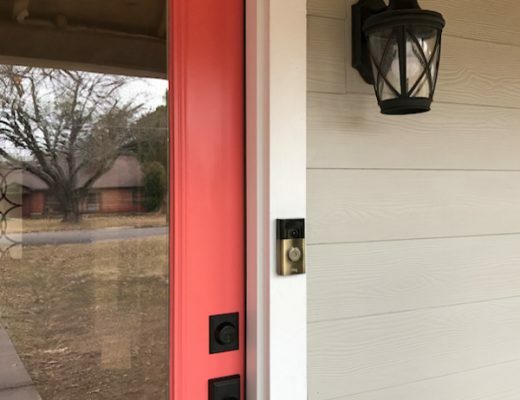 It seems to me that you have 1. been very intentional about designing a house that has you using the back, with your future mudroom/studio as your primary entrance and future plans for the driveway location and work area. This says to me that you have thought for some time that you will typically spend more time in the back than the front. And 2. you have talked about sitting in your breakfast room while on your computer, and enjoying it as a peaceful place. I think that looking out the windows to birds and flowers and a fountain will add to that tranquility in a way that Adirondack chairs and a porch will not. I also would go with the trellis and landscaped courtyard. Love the bowl style fountain on the boulders. The porch extension looks a little like an afterthought. Oh wait, it was. I would spend my money on completing the plans for inside and enjoy your large backyard from a deck with more privacy. What does Matt think? I really like your original idea. Enjoying the courtyard from your breakfast room sounds so delightful! Plus it would give your house great curb appeal. Adding the deck would mean adding more furniture to that area which would block your beautiful window and obstruct your view from inside the house. I also worry about how the deck would transition to the space you had planned for infront of the studio. Let me tell you how it is for us — we have a concrete front porch facing west and a wood back deck on the east-south side of the house. We are on the front porch for morning tea/coffee and for lunch and reading mail because it is shaded in the morning hours but gets hot sun all afternoon and into sunset. So in the late afternoon, evening, and twilight, we are on the back deck because it is shaded and inviting. So we use both! My advice — take into consideration the exposure of each and place and the times of day each place will be comfortable. The function for me is most important. And in the end, you will make it look lovely either way. I’ve added a small “bird sanctuary” and bird/butterfly friendly plants all around my house. Whatever window I look out, I am in a visual heaven. I think the window outside of your dining room would be perfect for such plantings. Watching birds/butterflies is so relaxing. It is a perfect place for greenery. I really think extending the porch looks nice, but it’s still missing something. With the garden you can get height with the trellis & flowers. With the extend porch you can’t. I know whatever you decided will be beautiful. Yep, stick with your original plan of a beautiful courtyard. 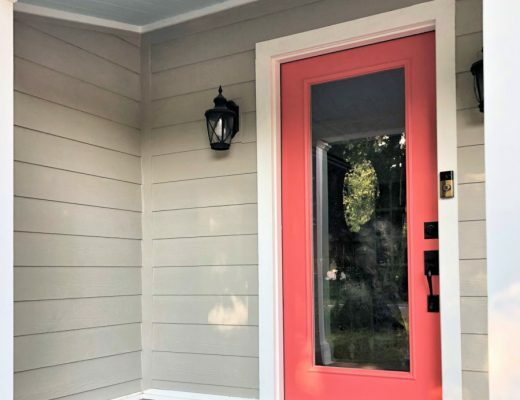 While the porch expansion is undoubtedly lovely, I think you’re probably correct in wondering how much you would actually use it. I think it would be so much more enjoyable to see the wildlife out those windows and keep the space you’d actually want to hang out in to the backyard. Just my thoughts, but I truly always end up loving everything you do, so I have no doubt whatever you choose will be amazing! You’ve hit the nail on the head – would you use that space (and how would you use that space so what will it look like on a daily basis?) Incorporating a seating area ( a bench) into a more natural space seems a more attractive and practical choice – to me….I’m confident you’ll process this out and make the best choice for you and Matt. Whatever you choose, I have no doubt it will be lovely. Keep up the good work. I always wanted a front porch; however living NC realized sitting outside is very limited because of the heat…I vote for your original plan. I absolutely love your Mom’s idea! I think it makes the house look better and is more cohesive! It ties the whole house together as the other way does not. BUT with your TALENT either way will be beautiful! Love your blog and keep up the good work. So exciting to see this come together!! As much as I’d love for you to do that front porch extension soonish, as I would love to have your directions for that which we seem to be unable to plan ourselves now for several years (in our back yard btw 🙂 ), I think that the comments above nail it: It’s only a good idea if you are really going to use it, otherwise the garden/courtyard/bird thingy is better. I would hazard the guess it would be nicer, too, as you can do a lot of landscaping (you’ve already planned some very nice aspects with the fountain and birdbath). So I would recommend you follow the advice of other commenters and consider the sun and wind situation and whether it makes this place appealing as a porch to both of you before you go and spend a lot of money on something that will be rarely used (or might even be the starting point of changing a lot of things that are already done and very beautiful as is, such as changing the – perfect – windows in the breakfast room for French doors or going even bigger and extending the porch in front of your studio, which in my opinion would be much too much). hope I don’t sound too harsh, sometimes it’s not easy to find the right tone in a foreign language… I love what you are doing but I think that your original idea for this area might just suit you and Matt better. Obviously I’m in agreement with the fountain courtyard look….all that color, texture and wildlife is what you love and feeds your soul. I’ve always thought that that little space would make a perfect enclosed (lattice covered in clematis or bougainvillea) easily accessible by wheelchair atrium kind of space! French doors where those windows are in your kitchen nook area that can be left open during the day for letting the pets lay in the sun, listening to the birds chirping, sitting outside with coffee/tea and the paper on Sunday, fairy lights on the matching white pergola you build above and dinner with loved ones at night. Connecting it to the front porch might be awesome too but a private/secure space that can be left open and let in fresh early morning/evening spring and fall air! (I really-really want an atrium space in my home) Any chance those windows can be used for those three that still need to be replaced and build some french doors instead? 😉 I’ll love seeing what you do with it in any case!! oops, I just read the comments and it seems I’m in the minority! I would use the hell out of that space…looks like it’s big enough for an outdoor sectional, coffee table, and bistro set… maybe you will too! A quick scroll thru the comments indicates to me that the majority is saying to nix the porch extension, and I agree. I see houses all the time with beautiful front porches, benches, swings, etc., and I always think, “what a waste!” People just don’t use those spaces as seating areas. I think your original idea of the fountain/garden area is great. You can create something so beautiful that you’ll enjoy from inside and that will perk up the whole front. Go with that! I had wondered about a deck/porch extension in that area but you were talking about fountains and the view from the breakfast room and I shelved suggesting it! I also wonder how a little courtyard there would look with a low wall? But as you say with that would be a useless space for Matt. If you’re going in that direction at all, I think the full deck area would be awesome. Maybe with a pergola? If you put in planters, you could still have a beautiful view of plants from the windows plus on the deck. When I looked at the photos in your last post, the inset of that area didn’t make sense, but I figured once you added landscaping it would all flow. Which is true. But – the extended porch makes even more sense to me. We have a small front porch and a back porch. We use the front porch for morning coffee, watching the world wake up. We use our back porch for entertaining and more private events. I genuinely see a value to both. I really think you’re on to something. I have also thought of that area as a potential courtyard….and…as long as we’re dreaming/brainstorming here…. It’s true that you have bigger plans down the road, my Mr. and I talk about things like that all the time…but as we’re getting older we are starting to appreciate enjoying what we can NOW…while we can. So we’re tackling things a little differently. We have a wood cedar deck and it is high maintenance. I know you could do that easily yourself but we find it expensive. It looks bad more than it looks good. We have lots of birds and they like berry producing bushes and trees. Landscaping will solve some of your problems – it does not all have to be hardscape. A birdbath or fountain as you envision would be enjoyable for you and Matt when sitting at your table. We really enjoy our views from our windows. I think it would take away from your porch to extend it across. Right now it is “just enough” going on with the coral front door, a couple of chairs with pretty cushions. I think that a really pretty fountain or bird bath will be perfect, along with landscaping. And I am DYING to see the trim for your living room panels, you have kept us in suspense too long LOL! I like your original idea of a showcase garden area with a water feature much, much better than adding more deck. I think it would compliment the front of your house more. IMVHO beautiful landscaping is the icing on the cake. It looks great, but I like your wildlife-attracting garden/fountain idea even better. The direction your house faces and how the sun hits the front and the back of your house may factor into whether or not you think its worth it. Also, whether or not you like to be sitting outdoors. I know I always love to look at beautiful outdoor spaces, but for me, I’m not one to go outside to just sit so it isn’t worth it for me to invest the money into seating/gathering areas when my home won’t be used that way. Either way, your house will look awesome. Personally I’m partial to the idea of sitting inside and enjoying beautiful landscaping and the animals it will attract regardless of the temperature outside. I love mom’s idea. I’d add French door for access from breakfast room. Maybe it’s the right time to consult a landscape designer. I think we readers could really benefit from seeing what the process and costs are to get some ideas on paper. Perhaps they could render it both ways to give you a better sense what that would look like with furniture on it and what it would look like from the curb. I think that we are all guilty of sometimes looking at one small area–a wall or portion of a wall–and thinking that we need to fill that space because it just seems so empty or not special. Decorate like that and suddenly everything is a feature and it doesn’t look right all together. I think it would also really benefit you to see what your fountain garden and other landscaping can do for the look of the house and you’d have a better idea of what costs will be down the road for landscaping. I like your original idea better. I think this might throw off the balance of the front, plus since the breakfast room area looks like it has a lower roofline it looks like it kind of cuts it in half. I think if you were able to do the step down it would be a little better… I also think you will likely use the back more once it is all done. Plus there is nothing that says you can’t put a bench or something out there amongst the wildlife area to sit when you want and maybe have a little trail from the side of the house to the front to make it easier for Matt to get over there as well. I will also say that having furniture in any area that is uncovered is really hard on the furniture, even if it is well cared for. the sun does a number on it after just a few seasons and even faster if you don’t store it through winter. Take another look at the photo with the fountain and then the porch mockup. Which is more delightful to the eye? I wouldn’t spend money on something that won’t be used. Consider waiting until you have finished the rest of the house to decide about expanding the front porch. 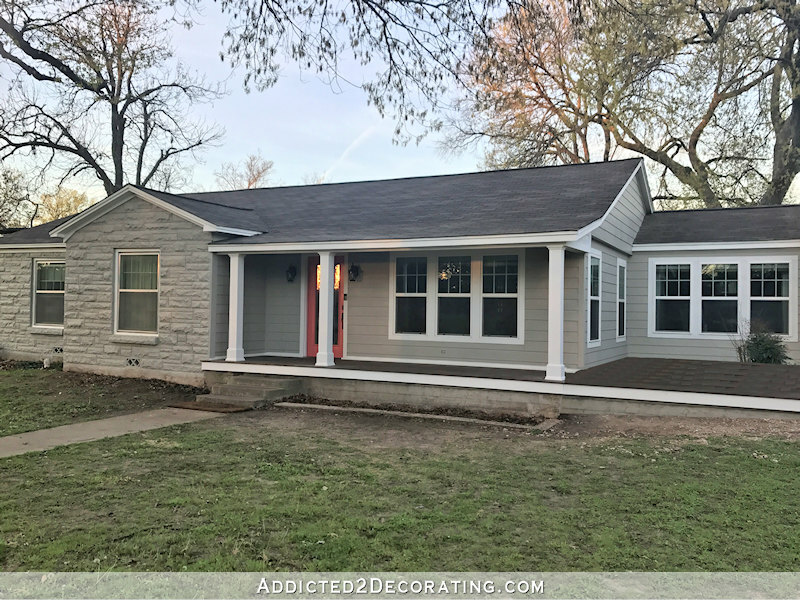 You will know what to do when you see how you and your husband actually use the completed house and its outdoor spaces. Also, you might want to consult a landscape designer/landscape architect about giving you several alternatives for design when you are ready to do the front garden area and landscape. What would he or she suggest for this area? Porch, no porch, trellis, arbor, garden? How will solar orientation and the daily and seasonal winds drive this decision? These are the things that a professional landscape architect is trained to consider in the ultimate design. If you do decide to expand the deck, consider replacing the breakfast room windows with French doors and roll away screens. Also, have you considered a detached, full sized pergola or attached roof trellis covering the whole courtyard deck area? I think this would make the expansion look completely unified with the front house elevation, yet add architectural interest. You might also consider a mock up with a larger trellis or pergola in front of the breakfast room windows over the garden courtyard, without the porch expansion. You have a remarkable design eye, so you will eventually settle on the perfect thing for this space. Nope, don’t do it. If it is just you and Matt and maybe a guest or two, the current front porch is big enough. If you have more people than can fit on that front porch, they will have to be in a separate area of the wrap around so not everyone can socialize with everyone else at the same time. With a larger group you will probably want to be in the back yard anyhow. It also seems the turn would be kind of narrow and possibly tricky for Matt to navigate safely so you will need to put wheel guards or a railing there. If you put a dining section in the courtyard section, you are a long way from the kitchen unless you change the breakfast room windows to doors. More importantly, you will be giving up a visual feature you will enjoy year round from inside for something you won’t be able to enjoy that often due to it being too hot, too cold, or raining, or too many bugs. I have a small front porch and a screened in back porch about the size of your front porch. I use both but I use the back porch much more often because it has a nice view of the backyard, it is private, and it is off the kitchen. I really liked your original plan of a peaceful garden area with views of creatures that inhabit it. The extra deck would not be very pleasing to the eye to look at from the inside. I think those windows in breakfast room would scream to be French doors. This whole idea would look wonderful in a backyard setting. Just not sure it would work in the front yard. You could also angle the corner by the studio, and have your fountain there. Haha, I actually have at my house almost the opposite situation. My view from our family room in the back of the house is a patio, sandwiched between a kitchen bump out on the left, and the fireplace bump out on the right. My dream has been to replace the door from the kitchen that leads to that patio with a window, and having french doors and a patio around the corner instead, so I can tear out that patio and have a little secret garden type area to landscape and enjoy from the family room. Anyway, I agree with the majority of posters – I would prefer the landscaping view outside the breakfast room better than patio furniture. Extended decking and patio furniture both have to be maintained (obviously, landscaping does too, but it’s different). You still have a nice sized front porch to sit on and enjoy, so you’re not giving up a front porch to have the garden area. And you know someday you’ll have a lovely back deck to enjoy with more privacy and likely a better view than the neighbor’s houses. The mock up looks amazing until you show the view with the third wall and you see it actually extends past the studio, giving you an awkward corner to work with that’s not balanced by anything on the other side, the way your current porch end is. Good luck! Always fun to dream! Your mom’s idea is lovely but I like your original idea better. It will be beautiful landscaped as you planned. How would you use the new deck space? I can see rocking or swinging on the original porch but the new deck area would make me feel like I was exposed, on display. If you have a nice backyard area, stick with that. You can always add another deck area in front later if you feel you need it. Plants are easy to move. And I agree with others, to look planned you would need to change dining room windows to a patio door. You wanted comments and it sure looks like you got ’em! I agree with the majority; stay with your original idea. I think you’ll get much more out of it (emotionally) and, as someone said, a garden bench could always be added. The upside of it is, of course, that it would not be as “permanent” as extending your front porch. Trying this first would allow you to try it for yourself and change it on down the road, if you wanted to. But, honestly, I don’t think you will! The first idea is definitely how I’d go! I think what you are attracted to is the cohesive look this gives the front of your house and it fits in beautifully architecturally. Yeah Mom! So I think it’s a project you do down the road. It adds incredible curb appeal, even if you use the back deck more. 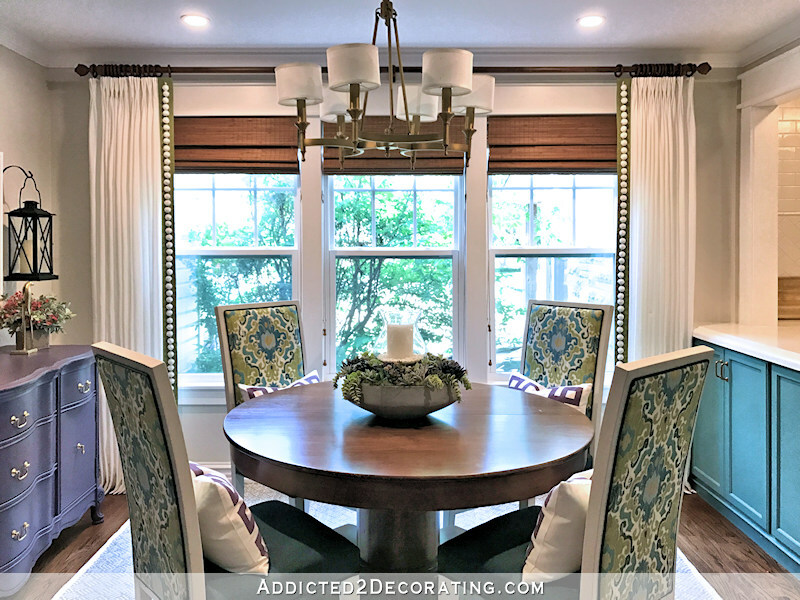 I think it looks nice but two things………I agree with above comment that you will want to change your new windows to French doors or sliders in the future and……….I doubt you will use it very much. I have a pretty front porch and we hardly ever use it, we are always in the back. Also, I think your vision of pretty shrubbery and a bird bath sounds amazing…..so my vote is not to extend your front porch! I have read through the comments and have to agree with the majority here. While I love your Mom’s idea and think it looks nice, I don’t think it is the best use for that space. As others have stated, you would need french door access to it, it would block some of the view from the dining room and how much would you actually use it if you also have a backyard deck. In addition, without it being covered, not only will it be hot and messy but you will have much more upkeep on it overall. One other thing to consider (and this also goes for when you add on to the back), if you build a typical deck with wood, you have to make sure that it is blocked with something so that critters won’t make a home underneath it. Trust me on this as we found this out the hard way! In the back, if you build your patio with your roof extended, you can add ceiling fans which will make it a lovely, cooler place to relax outdoors. I think your courtyard garden idea will be beautiful in that area in front of the dining room. This will be a lovely place to sit and watch the birds and butterflies while enjoying your meals or when you’re on your laptop. You could add a couple of concrete or wooden benches in that area to sit out there when you wanted to. As someone else pointed out, if you roast the birdseed, it will not germinate. Also, if you wanted to keep the squirrels (and other rodents) from taking over the bird feeders, add ground cayenne pepper sprinkled on before roasting . While the squirrels taste it (it doesn’t hurt them) and they don’t like it, birds do not have the sense of taste (it doesn’t hurt them either). I could just see this area with some trellis’ covered with clematis, climbing roses, etc. along with milkweed, zinnia’s, liatris, agapanthus, daylillies, etc. I would also add some evergreen shrubs around the perimeter or flowers that maybe have greenery all year so that in winter, you still have visual interest in the area. I liked what someone else said the best. I wouldn’t add much or decide fully what I was going to do until I finished the rest to see how we were going to use the spaces. Until you have the back area done, I don’t know that you would know if you would use the front or back more often. I’m sure whatever you decide to do, it will be beautiful, like everything you do! We have a large fountain/bird-feeding area like you are considering and while I love it, it’s in the back yard where no one can see the mess and clutter when I forget to clean the leaves and algae out of the fountain, or pull the weeds caused by the bird seed. Even the hulled sunflower seeds will sprout and will you have the time to roast them EVERY TIME to prevent germination? Our pest control dude told me to keep the bird feeders away from the house to help keep flea-infested squirrels and other critters (mice, chipmunks) away, so that’s a consideration as well. The lovely scene you have imagined requires work and maintenance to keep it lovely (like everything worth having), and personally I would just install the lattice overhang or even a pergola that could support some star jasmine which has a long blooming period. Or what about a small Japanese Maple or other small tree in front of the windows? Regardless, I know whatever direction you choose will be remarkable. Your home is looking so lovely. My thought is that you are in Waco where there are long hot summers. If you are not outdoor people now, a deck won’t be that big of an attraction. We are in the DFW area and our big old deck barely gets used because of the heat and mosquitoes. I would much rather have a lovely view in the AC year round. LOL I ended up putting bird feeders and flowers where we can see from our bay window and we love watching the wildlife. 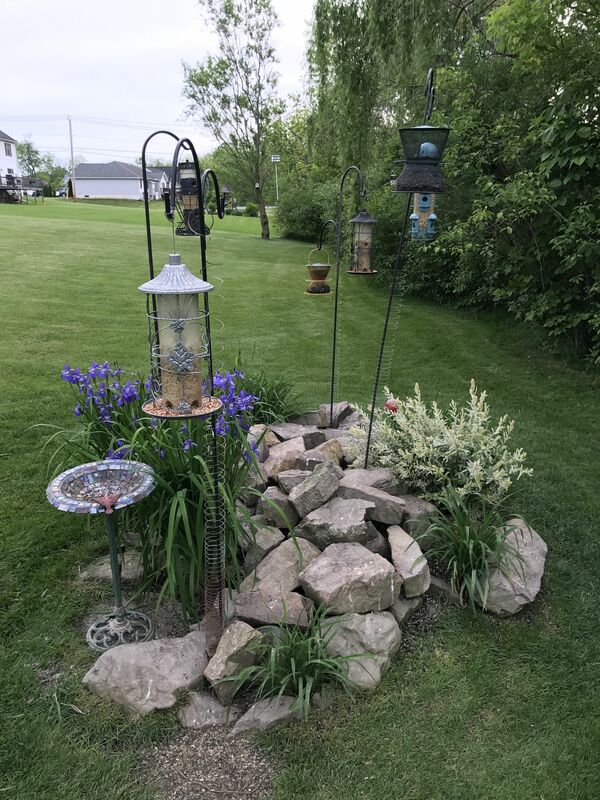 You’ve had plenty of input… but I’ll throw my thoughts into the ring… I LOVE looking out my windows onto the garden with my birdbath and hummingbird feeder. I’m not a Texan, but my understanding is that you have a lot of hot weather and if I were you, I’d enjoy a beautiful natural view from the cool inside more than sitting on an extended porch. So yes… I LOVE your original vision. A couple of thoughts about extending the porch: if Matt is to be able to access it, he would need to use the new front porch as a hallway, unless you did change the front breakfast room windows to french doors. So you wouldn’t be able to have rockers or a swing on the porch. If the extended porch is not covered, rain will splash up onto the siding, and onto the current porch as well. And if the sun is on that side of the house, it could be too hot to use during the summers. I love the idea of the fountain in front of the breakfast room windows, with flowers and shrubbery. I think you should stay with the original idea. Do you really want to sit out there watching cars go by? And when the back is done, you will never use it again. I think a beautiful landscaped area would be much better. Lovely idea, but Would You Use It? Beautiful landscaping, fountain, flowers and birds sounds more functional plus the visual from the dining room. We looked out of our breakfast room into the garden in a former house and it was just tranquil and peaceful. Just make it a courtyard but not with a concrete fountain. The one in the picture looks to be some kind of steel or aluminum. Even the color looks great. Matt can enjoy it from the breakfast room windows’ Love your posts. Reminder that the fountain will need rocks to within 3 inches from the top for the birds to bathe in it. Love you. Or I am just love porches! I think they extend the living space and I love being outside. You could still put a bird bath, bird feeders and pretty plants out there, but with the porch you could still “live” out there too. IS the benefit worth the cost? i guess only you and Matt can decide that. Either way, I love the depth and character that little inset gives. 1. What does the other side of the street look like? Something you would like to stare at? 2. How well do you get along with the neighbors across the street? 3. How much day and night traffic is there? 4. Would you and Matt enjoy being stared at? 6. How much direct sun would it get? 7. 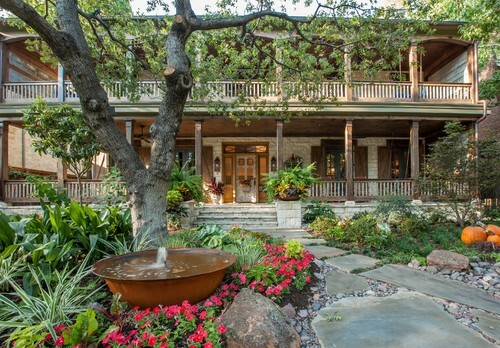 Regarding the fountain….fountains don’t belong in front of modest, albeit lovely, ranch homes. Completely out of character for the house. There are fountains that would look perfectly fine in a ranch home setting. Sure, not one like the Trevi fountain or an ornate thing, but a stone/rock one, or even a ground surface bubbler would be appropriate. You must be thinking a tacky ornate three tier fountain, nope, nope, nope! Just a quaint bowl, stone or pottery bubbling fountain is what she has in mind. What I have in mind would be fine with my modest ranch home. I just want a wide, shallow bowl (stone, pottery or even a metal) sitting atop some stone or brick. I basically want a bird bath that has continually running water to keep the water from getting stagnant or creating a breeding ground for mosquitoes. That sounds more like it! I gotta admit, my mind went to “whoa! That is way too much” but this is restrained and tasteful. Might be project for the Austin stone! Ditto to all of these ideas! I agree that the deck would draw the eye away from the front door. My idea, and I hope you get this far in your reading…build out the deck, put in French doors and enjoy this space sooner than later. There is nothing saying you and Matt wouldn’t use both a front and back deck at different times of the day and year. It could. Be a really nice place to enjoy breakfast in good weather. You could still have a fountain in front if the extension and landscaping to attract birds and butterflies in front of the deck. To be enjoyed from the dining room and deck. Yes, the birds and such won’t be so close to the house, but I think it a good thing. Squirrels will be right at your windows, too. The other consideration is cooking / eating on the back deck. Everything will need to be carried through the house. This would, with the addition of doors be a convenient outdoor eating area. Maybe not in the hottest portion of summer, but a lot of the year. I know you worked hard on getting the dining room just right, but you could start using this sooner than you’ll have a new family room and back deck. The extended porch mockup looks awesome, but I don’t think it would be practical. Plus, I agree it would probably be expensive. You said you want to sit in your breakfast room and watch nature, I think that would be the best for that area, especially since you said you will have a backyard deck. I’m sure whatever you decide will be gorgeous. I can’t wait to see the pantry and the studio finished. Wow, you started something here didnt cha😉. Be very honest with yourself if you would truly utilize the space. Are you outside, or inside kind of people. I love the mock up and could surely be softened with landscape, but you might be starting down a rabbit hole since it would make so much more sense with a French door. It seems you have been looking forward to watching the wildlife and soft bubbling sounds of a fountain. Still doable but just further away from the house. I had to present a landscape plan to our HOA and used the iScape app. It’s simple and easy. Think generous sweeping curving flower beds and add things with a variety of height. Maybe a mock-up would get it off your mind. I say soldier on! Plants can always be moved if you change your mind in the future. Kristi, WOW! Your exterior is coming along beautifully! I didn’t get through all the comments so you may have already spoke to this suggestion but I’ll offer it as we faced a similar situation in trying to marry additions: with the extended porch floor you might consider a pergola type roof between the two roofline protrusions that would essentially carry the roofline more symmetrically. I was hesitant when I first heard the idea, here, until I researched the limitless style options and played around with pencil and paper. Pergolas can be reasonably economical and upgraded as time and funds permit, make for both indoor/outdoor functionality, landscape and design options are limitless too. Whatever you decide to do will be a smashing success! I think the original idea of turning that unique area into a “nature sanctuary” is by far the better option. Reasons: (1) will be a gorgeous view from inside the house, and will add considerably curb appeal to the outside. Viewing what would be essentially a deck won’t be nearly the treat to the eye and ears as flowers and a fountain; (2) You can have all the advantages of the porch extension/deck in the “nature sanctuary” … make an area amongst the lovely greenery and water thingy where you can put some pretty chairs and maybe a little teak wood table; (3) The nature sanctuary could be ripped out later to install a deck/porch extension if you found that you use that area lots and you’d rather have that porch extension. Later deciding to go in the reverse direction (from an installed extended porch back to nature sanctuary) would be a costly decision. The extended porch decision isn’t realistically reversible. I totally agree. You’ll most likely enjoy the pretty natural area more than you would the porch. Our house has a decent size covered porch, but we NEVER use it, and we’ve been in our house 24 years. I agree with a lot of the commenters here: while the extended porch does look great, I bet you wouldn’t end up using it all that much. The courtyard would be so decorative and beautiful! I think in order to decide whether it’s worth it, you should decide whether it will get used. Around here (up north), we aren’t big front-porch sitters. We’re more likely to make use of a back deck or back porch for actual sitting, meals, and entertaining. If you’re planning to put in a back deck too and are more likely to use that, is it worth paying to bring the front area up to grade so Matt can get to it? You could just as easily do a little french garden area with a cobblestone path (or whatever) and your water fountain. I love a good courtyard. I vote stay with your original plan. OH my gosh, I love this idea, and I can’t wait to see what you decide on. I agree with you – it would be worth it if the space is going to be used. If the porch extension won’t get used, I love the idea of a courtyard with lots of pretty flowers and a fountain. Either way, I know the space will be beautiful! The original plan seems best. It would be nice to feed the birds and have a fountain. That’s best to do on natural ground. The scattered birdseed and droppings can be concealed with landscaping. A deck floor would just get very messy. My son says you need to put French doors where the dining room windows are so that you could just walk out on the porch your mother suggested. I think it all comes down to what direction your house faces. Where do you want to sit outside in the Texas sun? We use our porch a ton because the other option is too shady/buggy on the opposite side of our house. I’m assuming the sun would be the main factor in Texas and given the new proposed addition isn’t covered, if it’s not facing north that might not be very pleasant for most months of the year. Just something to think about! Personally, I really like the fountain idea. . . and think that a deck off the back of your house would be MUCH more practical, but then I’m a practical person (for the MOST part) LOL! I think it would never get used, and with no cover it would rot away quickly. I believe both of you would enjoy the space so much more as a place for birds and squirrels. Thinking about this more later, maybe this extension should be part of your future plan to redesign the porch? Or are you still planning to add a gable over it? It looks beautiful now but if you still plan a major update down the line? Looking for pictures of front decks I ran across this one with a little gable over the door and a pergola. Maybe some inspiration to find there. Completely different scale wise, of course. Your house has a much wider front area, but I liked the combination of the gable with the pergola. Nice lines. I also vote for the original plan. Without a door leading out there it won’t be a place you will miss once the backyard is complete. A sweet little spot for birds to splash in, squirrels to run through and color to abound will make for lovely breakfast views. I do recomend a fountain with some splash. It will sound so nice and pleasant when you are sitting at the table. Realistically, given your ambitious drive to accomplish, will you ever get to the point of spending hours at leisure, sitting outside? If so, sounds to me like you would enjoy the privacy and quiet of a backyard setting. If you envision a backyard space, and you already have a front porch, why would you need a third seating area? Your original plan sounds lovely. Nature wins on all counts. Interesting idea your Mom had, but for some reason, I don’t think you are much of a sitter 🙂 My vote is for the garden idea. Check out www,hummingbirdcentral.com for some great reasons why and how you can support the health and care of these amazing birds and others plus insects etc – they need our help and create mini-eco systems (think science projects : )) – it includes ideas and ways to design ideal spaces. Plus, there’s nothing lovelier than sitting inside with a view to a shaded happy space to boost happiness for all. I’d like to see a mock-up with the rail. But, I don’t think you’d use it, unless you do it right away, then you might use it until you get the backyard finished. But what would you do out there? Plus, you are sacrificing the beautiful view you envisioned with the fountain. Edit – the first sentence in my previous post is so awkward. 🙂 I meant to say, “I hadn’t read all comments and maybe someone had a similar idea to mine.” 🙂 Awed by your work, as always. Koi pond! Birds, butterflies, and fishies! I love this idea! I think it would add balance to the front of the house. I don’t think it would cost as much as you think. Essentially, you are building a deck between the two parts of your house. Remember when YHL built a deck between two parts of their second house? I would imagine it would be like that.